Average reading time 5 minutes. “WHAT?!? Did IntoTheGloss just launch its own make up brand?” is the first thing that crosses my mind when I find out about Glossier on ITG. “Why would anyone try to launch another make-up brand in this saturated market?” To say I am skeptical is an understatement. But my skepticism is replaced by excitement and a great craving when I discover the world of Glossier. And without having tried its products, I become one of its biggest fans. This is quite special, because I usually don’t get hooked until I try the product. But I got hooked to Glossier for reasons other than its products. I am ecstatic about this new makeup brand because of its marketing strategy which is genius. At some point last year I was randomly surfing the web and stumbled upon my favourite beauty blog IntoTheGloss, where a banner on the right side of my screen caught my attention. It was an ad for a Get Ready With Me Youtube video showing Emily sitting on the couch with her cat. Once I figured out that apparently, ITG and Glossier were related, I immediately surfed to Glossier.com and checked out the website. I remember being positively surprised, but not entirely convinced just yet. Then I saw the models looking amazing wearing _Generation G, and I remember thinking “OK, fair enough, these women actually look quite fabulous, maybe it’s worth checking out more of this brand”. Within a week, I had revisited its website and social media channels at least fifty times and was desperately craving a _Glossier Phase 2 set. So what exactly caused my willingness to splurge $50 on this unknown brand? And, equally important, do the products live up to the expectations? The brand’s social media strategy has undoubtedly helped most in increasing my obsession with the brand and convincing me to buy the _Phase 2 set. Rarely have I been more impressed with the love that women have for a make-up brand. They self-promote Glossier all over the place. This is word-of-mouth in its purest form: rather than simply using on-site testimonials (which it still uses, for example on its _Balm.com page, the internet is full of tutorial videos, selfies and tweets with women saying the brand’s products are the best they ever used. And this is exactly what made me crave Glossier more than anything else, because really, if fans are SO in love with it and women worldwide are dying to get their hands on it, then what more do I need to get convinced? This online love has been systematically planned for; Emily stated in Forbes’ Million$ podcast episode Skin Is In that she designed her products for the selfie generation. I got especially excited when I discovered Glossier’s #GRWM (Get Ready With Me) Youtube videos, because they allow me to see how real women use the products, and what the products look like once applied. Ofcourse, the #GRWM women are friends, employees or ambassadors of Glossier, but it doesn’t make the videos any less interesting. Some #GRWM ambassadors whose videos I’ve replayed dozens of times are Coco, Chrissstttiiine, and ofcourse, Emily herself. 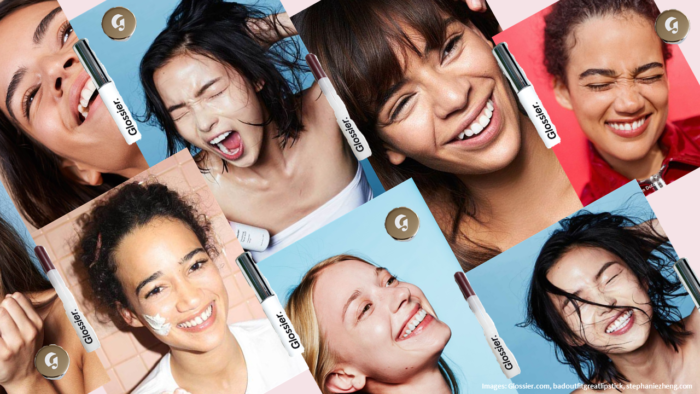 Besides, Glossier’s Instagram shows even more handy product videos, model shots and selfies from fans wearing the products, and summarizes its product portfolio, identity, and how-to videos. The social media channel that made my eyes grow bigger and my heart pound faster, however, must be its Twitter account, which is filled with retweets from women saying Glossier’s _Milky Jelly Cleanser, _Boy Brow, and _Stretch Concealer are the best products they have ever used. In fact, one just needs to open Glossier’s Twitter account to see how crazy women are about this brand. The brand’s communication strategy was the second most helpful in convincing me to buy its products. What’s brilliant is that Glossier clearly communicates on the products used in its photos. I know exactly which products are used in the model shots shown on-site and in social media (not only on Instagram but also in Youtube videos). The number of times I’ve wondered deeply about this before are countless, to the point that I got highly frustrated when even the sales staff couldn’t help me out. But no longer! Furthermore, the fact that the website’s product pages show me what the products look like once applied, and how the different product versions look on different skin tones, is truly brilliant. For example, check out _Generation G’s skin tone overview. Besides, I love the on-site product videos on the _Milky Jelly Cleanser (starring Emily! ), _The Supers, and _Glossier Phase 1. By showing me when and how to use the products, I get a clear idea of what I’m getting for my money if I were to buy them. Especially interesting about Emily’s video on the _Milky Jelly Cleanser is that she adds credibility by using the product herself and demonstrating that after using the cleanser and drying her face, she’s left with a clean towel. Last, by offering only a limited number of products and product versions, it’s easy to keep an overview, and decide which products to buy. The website was my first encounter with the brand, and a good one. It looks fresh and makes me really happy. Specifically, I start to smile when browsing Glossier.com because all the models are laughing and look amazing. I find happy faces all over the website, for example the one from Coco Baudelle smiling with some _Priming Moisturizer on, or Xiao Wen fighting the _Soothing Mist. Also, Glossier.com has a fresh air, which is – besides the happy looking models – enabled by the great product shots (for example I love every photo on the _Soothing Face Mist product page and the funny icons I see when hoovering over the photos. In addition, I love its tone of voice. Just scroll down to the bottom of the product overview page and you’ll understand what I mean. And then…the products! I’ve had to patiently wait for my order for five months, as Glossier doesn’t ship internationally yet. The waiting definitely helped in building excitement, but do the products actually live up to all the great things I’ve seen and read over the past months? Boy Brow is my favorite item out of the Phase 2 set. Out of Glossier’s makeup line, this product has been talked about the most and I can see why. First, I can’t believe how easy it is to apply. I just comb the little brush through my brows and within seconds, my eyebrows look much fuller. Plus, the gel keeps the hairs in place throughout the day. The result: naturally looking groomed brows. Would I repurchase? Definitely! There is no other brow product I’ve tried that makes my eye brows look this great this easily. Generation G is a great lipstick. What I love most is that it’s way easier to apply than any other lipstick I’ve tried. A few swipes and I’m good to go, no mirror required. Also, I like how moisturized my lips feel afterwards. While I usually apply a lip balm before putting on lipstick, Generation G is moisturizing enough by itself. Last, the matte finish gives my lips a natural look. A minor disappointment is that Like doesn’t have that much pigment and is therefore barely noticeable. Overall, the easy application process, moisturized feel and matte finish make Generation G one of a kind. Would I repurchase? Yes; given the benefits, I am willing to try out one of the darker shades. If it looks good, I will probably buy this lipstick more often. Just like Boy Brow and Generation G, this product is super easy to apply. The oily texture of the concealer gives me a glowy, fresh look. In contrast to Boy Brow and Generation G, however, I wouldn’t call this product one of a kind; it is not distinguishing enough to permanently substitute it for other concealers I’m using. Would I repurchase? Probably not; even though I am currently using this product daily for as long as it lasts, chances are small I would repurchase. I love Glossier. First, I can’t recall the last time a brand got me so excited and obsessed about its products. Applying the _Phase 2 set items makes me think back to those weeks I was hooked to the #GRWM YouTube videos from Coco and Emily, which automatically puts a grin on my face. Also, this frantic journey has resulted in discovering at least one, and possibly even two, great products that I will repurchase. Last, considering the great products it has launched so far, I can only imagine what’s next. Glossier got me hooked by the love from its fans expressed on social media. And on top of that, its products rock. Insanely obsessed with Glossier? You damn bet. Kudos. A lot of info! Very well voiced genuinely. .
Whoa plenty of valuable facts. You made your position quite effectively..